Donar MP3 Recorder is a flexible sound software designed to capture any sound in real-time (without having to create temporary files). It is a very easy and reliable way to record any sound whether voice from microphone, internet streaming audio, or music played by Winamp, Windows Media Player, Quick Time, Real Player, Flash, games, etc. This application provides direct support for RealPlayer, Winamp, Windows Media Player ,Power DVD ,Flash, Quick time and many others. You can save your recorded files into various popular types of format such as MP3, WMA, OGG, VOX, AU, AIFF. Donar MP3 Recorder offers high quality recordings and a neat-looking, user-friendly interface. 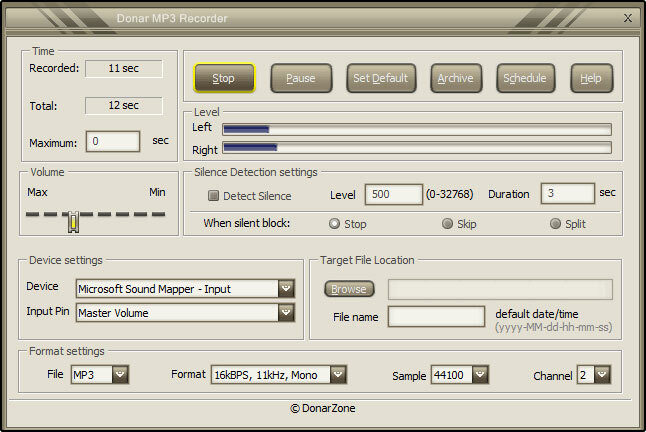 Donar MP3 Recorder is packed with a variety of features including a recording scheduler (allows you record for specified time intervals automatically) – the best way to easily record the Internet Radio shows you love – and total control over the recording quality meaning you get to make your heck mark will appear on the left of this menu item. Donar MP3 Recorder is a suitable choice for both novice and advanced users. It’s very easy to install and a pleasure to use! Any sound that goes through your computer (or comes from any other additional equipment such as Microphone, Cassette Tape, TV, Radio, Electronic Organ, Video Tape, CD Player, DVD Player) can now be easily captured and managed in many ways – Just download Donar MP3 Recorder and let it do its job! Enjoy Donar MP3 Recorder – Totally free, totally clean ! No ads, adware, spyware or any other malware! Basic: Allows total control over the recording quality. You are able to select frequency, bit rate, sample size, number of channels and volume of recording. Records sound in all popular media formats (WAV, MP3, WMA, OGG, VOX, AU, AIFF). Neat-looking, user-friendly interface and navigation. Smart Silence Detection – gives you a large freedom with the settings – you can choose to stop recording, skip silent block or start record to the new file when the volume of recorded sound drops below pre-established threshold. Additionally, Silence Detection settings will allow you to enable Voice Activation, when recording starts automatically after voice is detected and silent blocks are skipped. The Recording Scheduler – the perfect tool to capture your favorite Internet Radio shows on any specified date and time between the time intervals you wish.